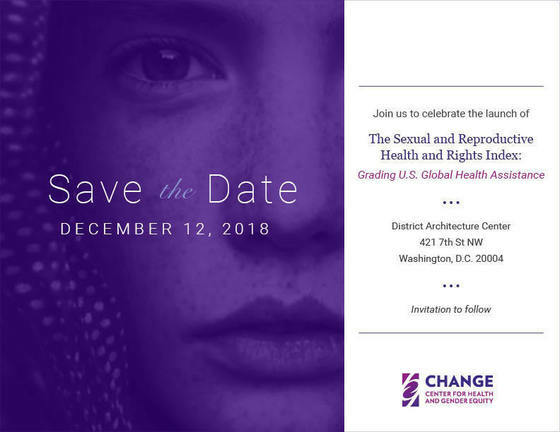 Please join the Center for Health and Gender Equity (CHANGE) for the launch of the Sexual and Reproductive Health and Rights Index: Grading U.S. Global Health Assistance. GWI was proud to develop the Index methodology. This first-of-its-kind index critically assesses the U.S. government’s work on sexual and reproductive health and rights (SRHR) in global health assistance and holds it accountable to its commitment on SRHR by producing an annual grade. Through an annual review of data and policy, the Index provides public access to information from across U.S. government agencies and health funding silos related to support for global SRHR. The Index grades commitments, leadership at the executive level, and funding levels and actions across a comprehensive set of SRHR issues.